De'Danann Glassworks is available to work with you on any project you may be interested in. 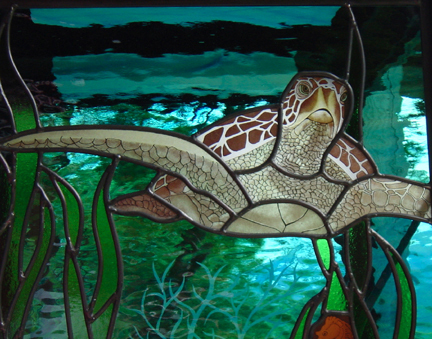 I work with all types and styles of stained glass. Some of the below examples show the different techniques I use. I am able to send design options through the internet. You may cantact me to inquire about custom work by phone, or email. This window is created mostly by silk screening. It was inspired by the church where the couple was married. By taking pictures of the windows, I could recreate the same look and feeling of that memorable moment in a personal gift. This techniques allows for almost any image to be incorporated in glass. This bunny is an example of how you can add just about any detail to make you window unique.